At last, no more roaming the streets of your town hoping Cupid’s arrow will guide you to that dreamy B-movie star or hot relative of the mayor. Because thanks to Tinder’s new Verified Profiles, those local celebrities on Tinder will now be verified—which, in theory, means your dream of dating them could come true! 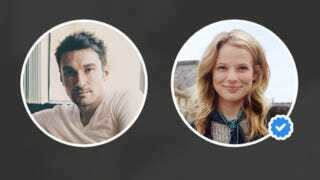 The location-based dating app announced the new verification feature today. The profiles of “notable” users will bear that telltale blue checkmark of prestige—yes, just like Twitter’s own verification feature. “Now when notable public figures, celebrities and athletes appear in your recommendations, you’ll know it’s for real,” the company explains, tantalizingly. One thing that remains unclear about this new functionality? Why folks who are used to fame would want even more attention—especially in the digital meat market of all places. But then, it also grants them the best of both worlds: They get all the fawning admiration that celebs enjoy, but can still filter matches, carefully curating their way to that perfect hookup. Celebrities: They’re just like us! Kinda. In reality, verification for Tinder is probably the kind of feature that’s aimed at making the app attractive to users who aren’t verified, just as much as the ones who are.